Residential infill construction activity in the City of Toronto has more than doubled between 2010 and 2015. This has led to a growing number of issues for builders working in a densely built environment, and neighbours who face multiple issues when builders do not comply with City regulations and bylaws. Encouraging good construction practices in the building industry through education, more effective enforcement (tickets/fines), introductory inspections, and increased building inspector knowledge. Strategic approach to resolve issues in a more timely manner. Additional Building Inspection – An additional inspection will be required at the beginning of construction and, when necessary, towards the end of a project to encourage timely completion. Increased Use of Tickets – A ticketing pilot will be introduced to evaluate if, through the issuance of tickets, builders would comply more quickly when violations are identified. Verification of Compliance with Issued Permit – Steps are being taken to strengthen the zoning-related knowledge of building inspectors through additional training. As-built surveys will be required early in the construction process to confirm height and setback requirements, as well as the elevation of below-grade garages. Dedicated Residential Infill Website – Toronto Building will be working with other Divisions to develop a dedicated residential infill website. 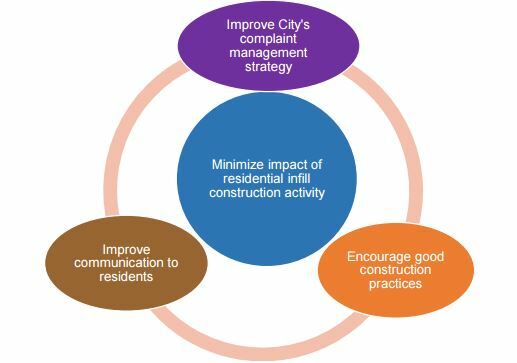 Best Practices Guide – Toronto Building will facilitate the development of a Best Practices guide on residential infill construction with key stakeholders. Construction Site Notice – Requirement for a Notice to be posted on the infill construction sites, containing key project information so residents will be better informed about the project underway and who to contact with concerns. A bylaw will be developed with respect to dust control measures as they relate to construction activities in residential areas, to be considered by Council in 2017.